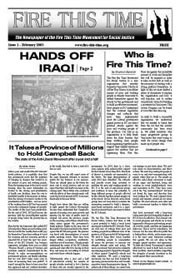 Issue # 22/23 - of Fire This Time Newspaper Now Available! 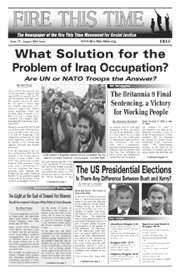 The newest issue of our newspaper is now available! 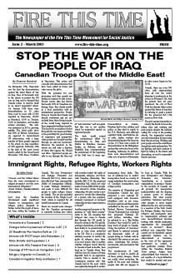 Featuring an update on the so-called 'elections' in Iraq, we also have coverage of imperialist manouverings against Iran, developments in Palestine, Indigenous poverty in Canada, and the occupation of Haiti. We have also included a recent interview with Ricardo Alarcon, Cuba's Vice-President, which we have printed in English and Spanish. To view the newspaper in PDF Format, click here (file size: 4.34 MB). Issue #20/21 now avaliable online! 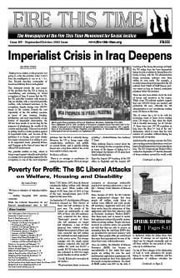 Featured in this issue: Articles on the current crisis in Iraq, the development of occupation and destruction in Afghanistan and Haiti, imperialist expansion to Sudan, the struggle of the Haida nation in BC... and more!. 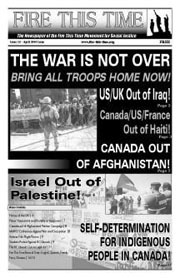 Incliding interviews with Toronto ISM activist Kole, Palestine solidarity activist Dan Freeman-Maloy, Labour and immigrant rights fighter Emily Tang... and more! Also including a interview and report on the victory of the Langara 2! 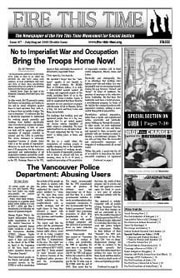 To view the newspaper in PDF format, click here (File size 5.52 MB). 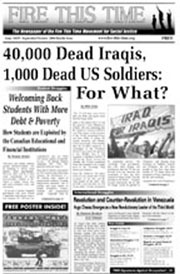 Featuring in-depth analysis on political developments in Venezuela, we also have an update on the deepening quagmire of the US-led occupation forces in Iraq, the attacks facing students in BC and Canada, and the War Resisters struggle in Canada. We have included a recent speech to the UN by Felipe Roque, foreign minister of the Cuban government, which we have printed in English and Spanish. 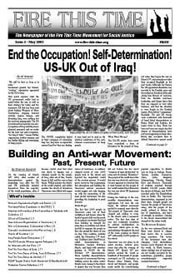 We also have interviews with Korean Student Network Against War organizers, Julie Berg (sister of the late Jeff Berg), and Meeghan Maultsaid from Under The Volcano. To view the newspaper in PDF format, click here (File size 3.82 MB). 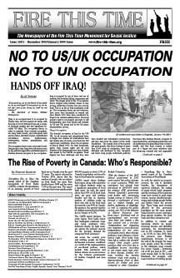 Featuring coverage on the crisis for the US-led occupation of Iraq, for this issue we have also included coverage of the elections in the US, the oil referendum in Bolivia, the political crisis in Israel, and BC struggles against the Campbell government. We also have interviews with Vancouver City Councillor Tim Louis and Chief Garry John of the St'at'imc Chief Council. To view the newspaper in PDF format, click here (File size 3.87 MB). 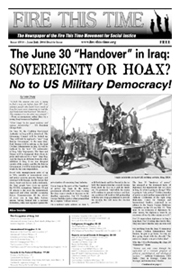 Featuring coverage on the phony 'handover of sovereignty' in Iraq and the federal elections, for this issue we have also included interviews with Jeremy Hinzman, Riadh Muslih, Libby Davies, Itrath Syed, Jason Mann, and Raya Sami. 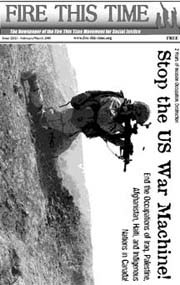 We also have coverage on imperialist interventions in Cuba, Venezuela, Palestine, South Korea, and Haiti. Sorry, issue # 15/16 is currently unavailable online. 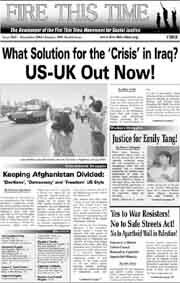 May 2004 issue. 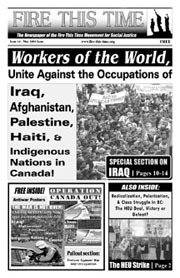 Features extensive coverage on the Hospital workers strike in BC during April and early May of 2004. To view the newspaper in PDF format, click here (File size 2.66 MB). 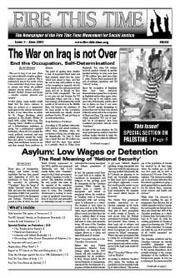 Special issue in support of striking healthcare workers! To view the newspaper in PDF format, click here (File size 1.68 MB). To view the newspaper in PDF format, click here (File size 2.45 MB). To view the newspaper in PDF format, click here (File size 3.10 MB). To view the newspaper in PDF format, click here (File size 2.05 MB). To view the newspaper in PDF format, click here (File size 1.84 MB). To view the newspaper in PDF format, click here (File size 1.87 MB). 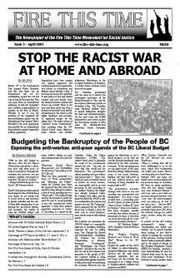 To view the newspaper in PDF format, click here (File size 1.82 MB). To view the newspaper in PDF format, click here (File size 1.7 MB). To view the newspaper in PDF format, click here (File size 800 KB). To view the newspaper in PDF format, click here (File size 570 KB).